[PACKAGE INCLUDES]: 1 X T95Z Plus TV Box, 1 X IR Remote, 1 X Power Adapter(5V/2A), 1 X HDMI Cable, 1 X User Manual, and 1 X Backlit Mini Wireless Keyboard. 【Latest Android Software】: Powerful Android 7.1 operating system which has a better compatibility of software, games and application programs. Supports HD 1080P upto 4K resolution and H.265 VP9 decoding, and tons of apps from the Google Play Store like YouTube, Netflix, Skype, Twitter, Facebook, KODI, Movies, TV Shows ready to play right out of the box. 【Big Performance & Storage】: 3GB DDR RAM for smooth video playback and with 32GB of ROM it has the highest storage in the market at present. Plenty of DDR RAM ensures speed and stability of the operating system. 32GB of storage provides you enough space for downloading videos or games. 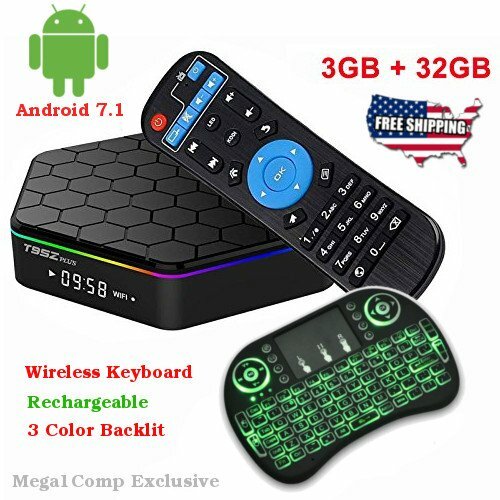 【Comes with Mini Wireless Keybaord】: This Android tv box comes with a Re-chargeable 2.4G wireless keybaord touchpad BACKLIT remote, which is very comfortable for typing, searching and browsing internet. The mini keyboard is rechargable and comes with li-ion battery so that you don't have to worry about batteries any more. 【Mega1Comp Guarantee】: Buying from Mega1Comp will give you peace of mind, we are USA based and ship from USA. Email and Phone support is provided. 100% Genuine Product Warranty for this T95Z Plus TV Box. If you have any questions about this product by T95Z PLUS, contact us by completing and submitting the form below. If you are looking for a specif part number, please include it with your message.